Ready to enter the marvellous Egyptian World where papyrus, pharaoh, mummies and scarab are usually depicted along the many Ancient Egyptian themed slots. Pyramid, gargantuan unique tombs of shining white limestone - you know that rectangular building built as Egyptian tombs... Well, on Coins of Egypt Slot, a thrilling video slot, you will travel to the rhythm and music of Egypt. NetEnt created this 5-reel and 20 paylines for some unparalleled spinning adventure. Embark on this virtual trip for potential wins. Good news! Coins of Egypt is available on the screens of your mobile phones, desktop and tablet devices. You can have fun anywhere and anytime at your own convenience. May your adventure start with the following? 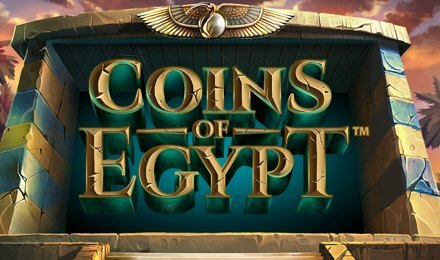 Coins of Egypt Slot is a marvellous creation with top-flight graphics and outstanding soundtrack. Close your eyes and you might feel the Egyptian vibe around. There’s a myriad of Egyptian related symbols set within its magnificent reels. The slot machine takes place in front of a temple and it includes symbols like the God of Sky- Horus, God of embalming and the dead – Anubis on either side of the stupefying reels. On the reels, you can catch glimpse of 5 types of scarab beetles, Bastet, Isis, Anubis, Scorpions and Wadjet. Amount of Paylines Selection: The 20 win line of the Egyptian themed slot cannot be changed through your gaming sessions. Coin Values: You can opt for the following coin values as you start your spinning adventure: 0.01, 0.02, 0.05, 0.10, 0.20, 0.50 and 1.00. On Coins of Egypt Slot the golden fly is the wild symbol. It can substitute all the symbols on the reels except for the scatter symbols, collect symbols and chest seal. If you land 5 golden fly wild symbol anywhere across the paylines, you will be bestowed with 150x your overall stake. The fabulous Coins of Egypt Slot comes with a special feature in the name of Pharaoh Coins Win Feature in the base game. Keep your eyes wide open! You may find 1 to 3 coins with prizes that varies between 2 and 15 times your overall stake which might come into view on reels one, two and three on every spin. Then, all coin will be collected and added to any of your winning combination that has been created when a collect symbol fell on reel 5. Here comes the star of the show! – The Free Spins Feature. But how is it launched? In the event, that you find 3 scatter symbols landing on reel 1, 3 and 5 in the main game, the Free Spin Feature will be activated. The whole value of all the coins on the activating spin are then added to each chest. Now, you will find that up to 3 coins, that is 1 per reel can crop up on reels 1, 2 and 3 on each free spin. Each of their values will be added to the corresponding chests: Ruby Eagle Chest, Emerald Snake Chest and Golden Cat Chest. That’s not the end! You will find that there are 3 chest seal symbols which correspond to each chest of the game. They only appear on reel 5. Now, there will be only 1 chest seal that will be collected on each free spin. As soon as 3 identical chest seals have been collected on reel 5, the Free Spins will stop. Now, all the coins that you’ve gathers into the chest will be added to your winnings from the feature.